The Nokia X71 is the first smartphone from the brand to pack a punch-hole camera (one that's entirely surrounded by screen) instead of a chunky bezel or display notch, making it arguably the firm's best looking handset to date (since its Android revival). Update: we've had comment from Nokia to say the X71 is unlikely to make it out of China and Taiwan. The handset has only been announced in China and Taiwan, and a HMD Global (the Finnish firm which now produces Nokia phones) spokesperson told us "at this point, there are no further plans to bring it to other markets". 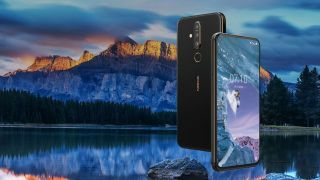 As well as the 16MP punch-hole selfie camera, the Nokia X71 also offers up a 6.39-inch Full HD+ display, Snapdragon 660 chipset, 6GB of RAM, 128GB of internal storage, microSD slot, triple rear cameras (48MP + 8MP + 5MP) and a 3,500mAh battery. There's also a 3.5mm headphone jack and a rear-mounted fingerprint scanner, ensuring that the X71 is well equipped. While the spec sheet is relatively impressive, the Nokia X71 won't be challenging the new Nokia 9 PureView flagship which sits at the top of Nokia's phone range. Rather, the X71 will slide into the middle of the line, which is good news as the handset looks well equipped to be competitive in this market, and the pure Android 9 Pie operating system ensures it will be receive swift software and security updates. The handset measures 157.19 x 76.45 x 7.98mm and tips the scales at 180g, but there's no word on price with the only option on the Nokia Phones Taiwan site being to register your interest in the device. The Samsung Galaxy S10 and Honor View 20 also have punch-hole cameras.